I learned many things during my 12 day trip to Thailand. 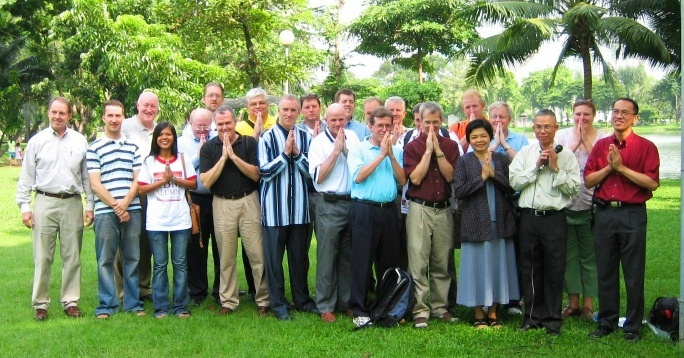 The first is that Thailand is the best place to hold a Thai mission reunion! 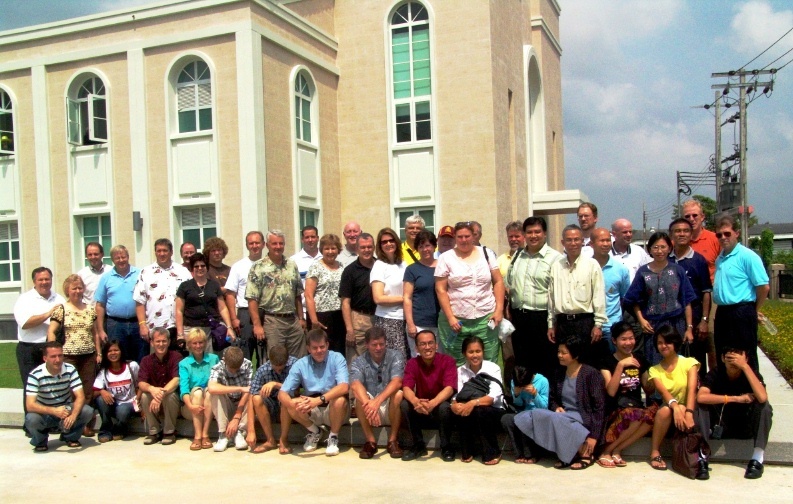 About 50 former missionaries who served in Thailand returned to join with members of the Bangkok Thailand Stake to celebrate "40 years since the Dedication of Thailand for the Preaching of the Gospel". Elder Gordon B. Hinckley then a young member of the Quorum of Twelve Apostles dedicated Thailand for the Preaching of the Gospel on November 2, 1966. This occurred at the height of the war in nearby Vietnam. 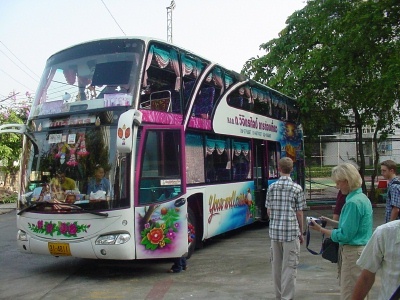 On Friday October 20, the Bangkok stake rented a bus to take the returning missionaries around Bangkok. 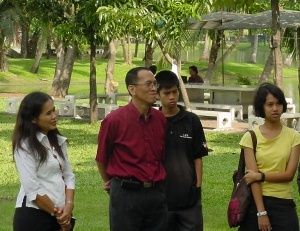 Departing at 8 am from the college next door to the Asoke chapel the bus headed out for the Lumpini Park. 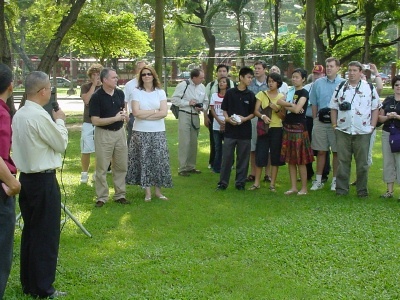 At Lumpini Park we exited the bus and gathered around the "Clock Tower" where it is believed that Elder Hinckley offered the prayer of dedication. Wisit Khanakham president of the Bangkok Thailand Stake explained to those gathered the significance of what had occurred here almost 40 years earlier. 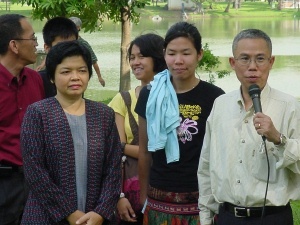 President Wisit and his 1st counselor Wisan Wisanbannawit also introduced their family members who accompanied them. After leaving Lumpini Park we proceeded to cross the King Taksin Bridge to Thonburi and travel west to Bangkae where the stake is completing a new two story chapel. While at the Bangkae ward we met some of the local members including President Thipparad who was the first president of the Bangkok Stake along with Peter Wilden and his wife Sister Dum. This will be their new chapel when it is completed in November or December 2006. From Bangkae it was a long ride to the new Srinakarin ward building (Near Sukumvit and On Nut Road). 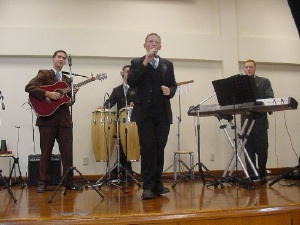 During the long slow drive most of the returned missionaries had a chance to tell their mission stories. 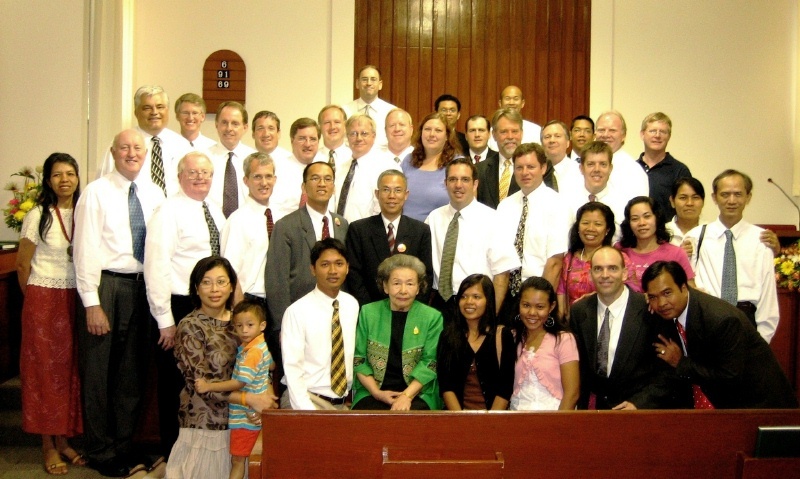 David Phelps (another RM who has lived many years in Thailand) was the source of many stories regarding things that have happened since the time that most of the RMs on the bus had served. [Many of the stories can also be found in "Translating Scripture: The Thai Book of Mormon]. Dave reminded us of the rotdee that we all loved (but many had forgotten - he even bought some for us when we returned to Asoke!) as well as introducing us to the new things such as the sky train, subway, and motorcycle transportation (use them when you positively have to be somewhere on time). 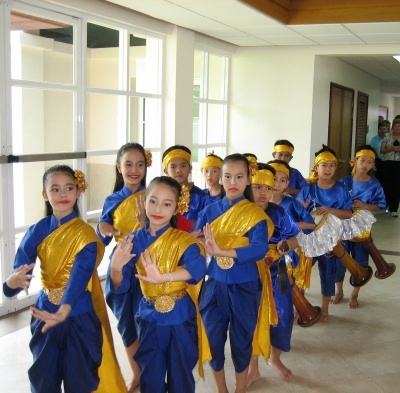 At the new Srinakarin building a group of children dancers and musicians greeted us and lead us into the new building. While there President Wisit introduced the leaders of the Srinakarin Ward and we all enjoyed everyone's favorite Thai desert "Sticky rice and Mango!" Larry White who was one of the first six missionaries to serve in Thailand and Mission President (1991-1994) caught up with the group as we were about to leave the Srinakarin Ward building. 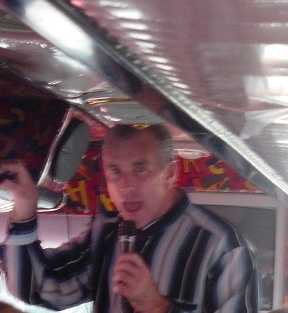 Larry led the discussion as the bus returned to the Asoke building through increasingly crowded late afternoon Bangkok traffic. Larry was quite the comedian for this part of the journey, joking with his good friend and another member of the first six Alan Hess. 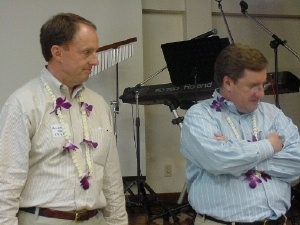 Arriving back at the Asoke building all of the returning missionaries received a Thai orchid lei. It was time for dinner which included Mussamun Curry (a personal favorite - due to its' sweetness). I learned that this curry is more popular in the south of Thailand than the Bangkok area and can actually be hard to find at restaurants in Bangkok. I learned to love it while serving in Ayuthaya where our landlady and her maid often made it for us for dinner. During dinner we were entertained by the current SYS (Sidthichon Yuk Sudthai) musical group (the mission's musical ambassadors of good will). 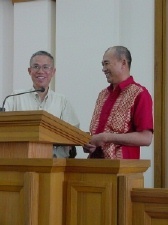 Alan Hess and Larry White were introduced as two of the six missionaries who entered Thailand in February 1968. Brother Sathid was the master of ceremonies for some contests including "Guess which Mission Mother this is?" while displaying on the screen just the hair on one side of the head from the official mission president's portraits. Following dinner and the entertainment a fireside was held with the members of the Bangkok Thailand stake. During the fireside the returning missionaries were allowed to bear their testimonies following which the returning mission presidents Larry R. White and Martin Slater shared their testimonies. Messages were also read from presidents Corriveau, and Goodman. 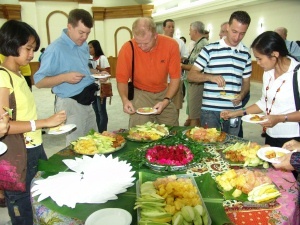 On Saturday events began at 8:30 am with breakfast. 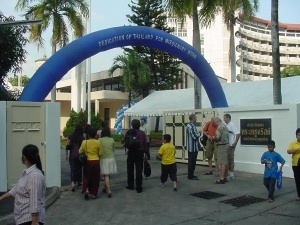 Rooms in the Asoke meeting house were set up for displays by Public Affairs, the Thailand Bangkok Mission, Thailand Distribution Center, Family History, Church Education System, Employment Resources, and Latter-day Saint Charities. At 10 am there was a DVD presentation relating many topics about the church all of which were narrated in the Thai language. During the day Thai members and the returning missionaries were allowed time to write letters to themselves or family or friends. These letters will be delivered at the time of the 50th anniversary. The letters were all deposited into a "time capsule" box. Lunch and dinner were also provided to all in attendance. 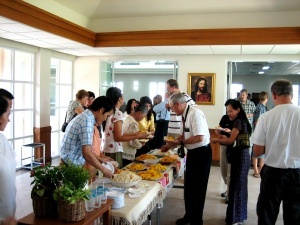 In the afternoon there was a presentation of church history in Thailand with several photographs. I was asked to provide both the Thai and English narration for the historical photographs (some of which are found in Translating Scripture: The Thai Book of Mormon). 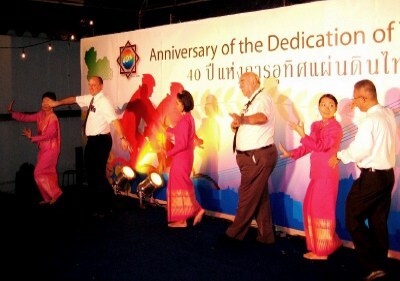 The video recorded when President Hansen left Thailand in July upon completion of his three years of service as mission president was also played. 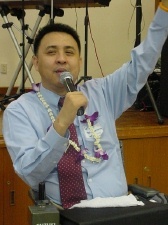 In the video he offered his testimony and greetings to those assembled. 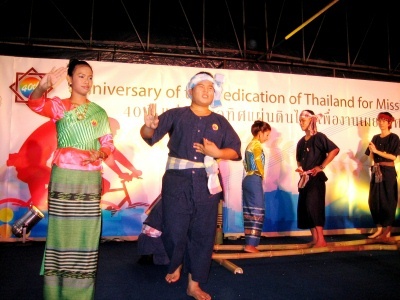 In the evening following some more entertainment by SYS each unit in the stake presented a Thai Cultural performance on the stage set up in the parking lot outside the Asoke Building. The performances were simply outstanding; better in many cases than you would find at a tourist stop featuring such entertainment. On Sunday October 22 the final event of the celebration was a special sacrament service held at the Asoke Ward at 1:00 P.M. At this meeting all of the returned missionaries who were present were invited to sit on the stand. 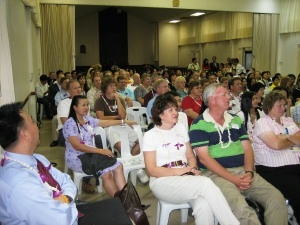 The meeting was extended by one additional hour to allow time for all former missionaries to share their testimonies. 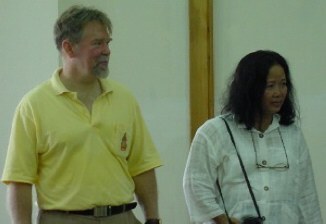 Also in attendance at this meeting were Sister Srilaksana the principal translator of the Thai Book of Mormon and Brother Ponchai the stake patriarch. Sister Srilaksana was called forward at the end of the meeting to share her testimony. 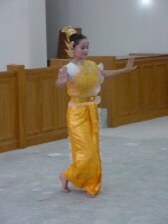 She later told me that hearing the missionaries' testimonies was the most meaningful part of the celebration for her. 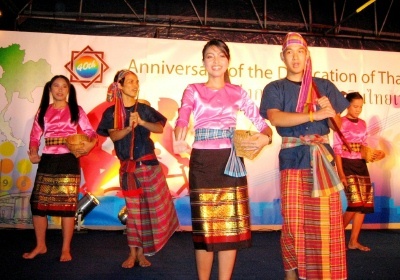 Note: Photographs marked with "*" were provided by Wisan Wisanbannawit.